sediment's wargame blog: Vapnartak 2019 - additions to the stash. Vapnartak 2019 - additions to the stash. Will and I headed out for Manchester extra early in the morning, expecting a clear run, only to find the motorway blocked with quite a bad RTC. Added 20 minutes to our journey, so not too bad for us, but a bit of a disaster for those caught up in it. We transferred to Steve motor and, along with Dave, headed off to the show in York. Dave, Steve and Will, along with Dave of Dave Lanchester books, make up the acceptable faces of the Lance & Longbow Society. 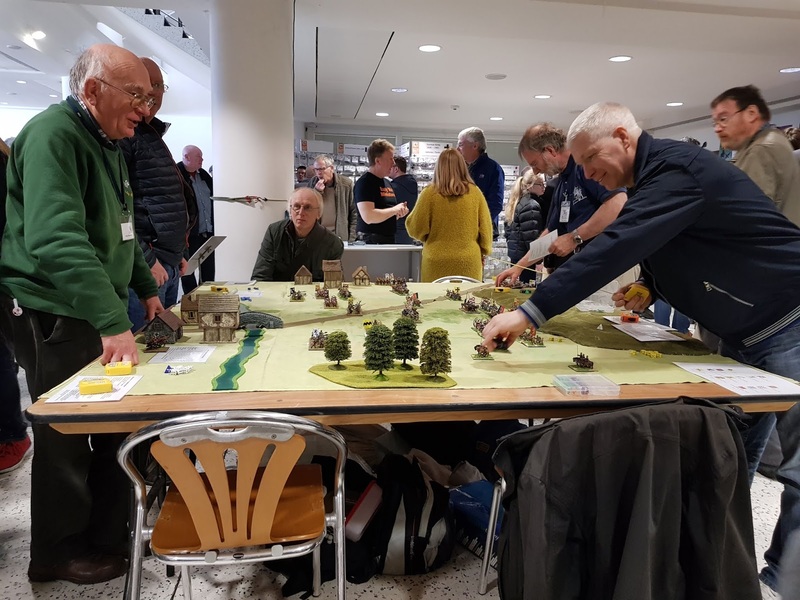 In no time, we had set up the L&L stand, selling an assortment of books and pamphlets concentrating on the medieval period, chiefly the Wars of the Roses, and a participation game "The Battle of Stamford Bridge? ", a fictional engagement between Neville and Percy during the Wars of the Roses (pictured below). Steve and Dave ran this game at least three times during the show, which was great to see as there were quite a few eager participants, including some youngsters. Will was kept busy running the stall with my willing, but largely ineffective assistance. We did manage to do some shopping, which for me included picking up a pre-order from Peter Pig and another from Early War Miniatures. I also managed to get in to the Rapid-Fire stall early on and snaffled some nice Ready-to-Roll vehicles and also visited Grubby for some Britannia vehicles and figures. The 20mm haul includes 3 Pz IVF2s for Torch, a pair of CV-35s and a pair of Semovente-75s, plus 2 MkVIs for an Operation Hercules scenario. There are two Sherman dozers to provide some engineering support to a US boat team for a D-day game, plus assorted US and British recce, including 2 Daimler ACs, a Humber AC, 2 Staghound ACs, a Humber light recce car, an M20 and an M, a Dodge command car and a comms jeep. Then for late war, there are 2 Hetzers and an Sdkfz 140/1, plus some assorted guns including 2 MG tobruks and 2 tank turret tobruks, a redestal Pak 38, a 120mm mortar and a 37mm Flak, as well as a couple of crews for Airfix 75mm Pack Howitzers. 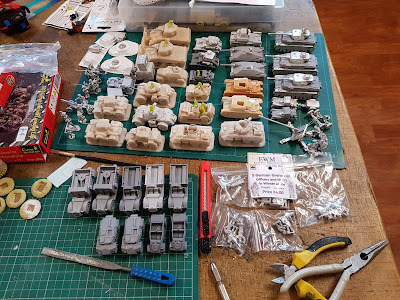 There are also some repaired vehicles from the £1 miscast EWM stand, including 3 Fiat trucks and 2 Fiat Breda AA portees, 2 Humber SCs and 2 Kubelwagens, plus a Dingo SC. These weren't all from Vapa, but I've worked on them as a batch to get them ready for painting. In the bags are some assorted Britannia British paratroopers and EWM British drivers and their new and most excellent Germans in winter smocks. I only bought a couple of packs of the new Germans, but they are lovely and I can see me getting more as well as their new US infantry figures if they are anything like as good. Crews are all Hat plastics from the US and British tank riders sets that I bought in Sheffield back in October. Will very kindly gave me some US tank crewmen, and I need to find the last pair of these to crew the M20 and M8. The Semoventes will need some crew too as they are modelled open hatched. All in all, a good haul. I'd missed getting to Warfare and Recon this year, so had saved up a bit of goodwill with the boss and so put that to good use by rounding out a few projects that I've had on the go for a while now. Not sure when I'll get to paint these, as I've not picked up a brush since before Christmas. Hopefully soon. As ever, thanks for looking.